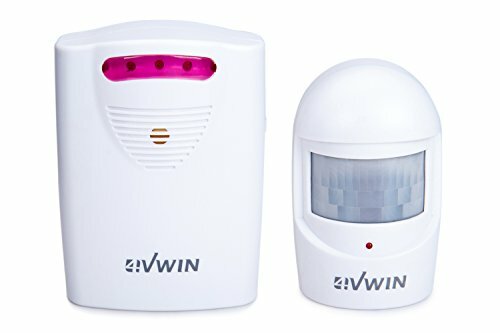 4VWIN driveway alarm provides a convenient and economic way to alert you the moment when someone enters you house,garage or other properties.When movement is detected, the Passive Infrared (PIR) sensor sends a wireless signal to the receiver unit from up to 400 feet away.Using the receiver unit, you can choose to be alerted by a high or low chime. Contains small and pointed parts,please be careful with use and keep out of reach of children. LONG RANGE CONNECTION - Motion Sensors can connect with Receivier from up to 350 feet away(in open space)! If you have any questions about this product by 4VWIN, contact us by completing and submitting the form below. If you are looking for a specif part number, please include it with your message.